San Francisco Newlyweds, Michael and Mary Gassen were barely able to fulfill their dream of opening up Noe Valley Bakery. They took on huge financial burdens by investing their life savings, maxing out on their credit cards, and taking on a business loan. Back in the 1990’s, that was the only method of financing for small businesses, but today, small businesses have the opportunity to raise money by running a Kickstarter Campaign (bit.ly/NVBkryKickstrtr). Almost 20 years later, Michael and Mary are freshening up their online website and offline storefront by raising money in this modern way. In 1995, the old-fashioned, all-American Bakery was a rare find in most neighborhoods in San Francisco. It was easy to find baked goods mass produced or machine made in supermarkets. The Gassens opened Noe Valley Bakery, so Michael could pursue his passion for making artisan, small batch baked goods. Mary carefully drafted a business plan to project how much was needed to run the bakery successfully. On February 18th 1995, this young couple put everything on the line and “quietly” opened their doors at 7 a.m. They were surprised that by 12:30 p.m., they sold had out of everything. Their expectations were exceeded on day 1, which has motivated the Gassens to continue meeting the demand of this homey neighborhood for nearly 20 years. Michael says that he still gets a rise out of customers timing their daily morning visit for when their hot, fresh homemade bread is being pulled out of oven. At 15 years old, Michael Gassen fell in love with baking when he was working at a part-time job in a small bakery. His favorite pastry to make back then was a “Cow Patty”. It was called that because it was a huge, overproofed Cinnamon Roll with lots of cinnamon powder. The customers couldn’t get enough. This early or “accidental” calling led to a career in baking. Mary Gassen arrived in San Francisco over 20+ years ago to go to Culinary School and met Michael while working for an Italian Restaurant company. After settling into their first apartment in Noe Valley, they would stroll down 24th Street (the main street of this community) and peer through the window of a small bakery. They desperately wanted to own this store that had been servicing this community since 1908. The Gassens felt right at home because most of the businesses were (and still are) family-owned and operated. Over the years, Noe Valley Bakery has made some subtle product changes but has stuck to their core beliefs of an old-fashioned, neighborhood bakery, where everything is made by hand, in small batches, and at the store. In preparations for their 20th Anniversary, the Gassens began remodeling their store last summer (2014). 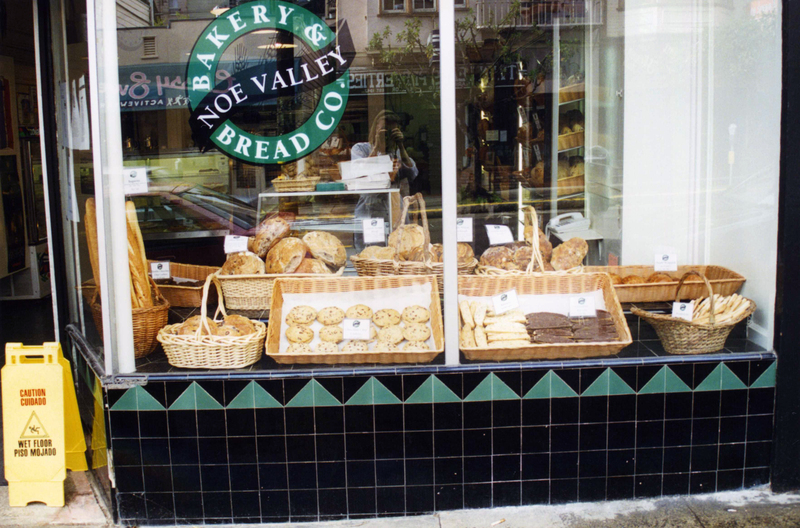 Customers daily routines were disrupted when Noe Valley Bakery was shut down for a whole week. When they reopened, many customers commented that the store was finally shaping up to match the artisan, fresh, high-quality items that they have come to enjoy. Due to the high cost of remodeling anything in San Francisco, Mary and Michael lacked the finances to finish the job. They liked the idea of drawing from their local and virtual community for the finishing touches to their store, plus build out a new website. As they set upon the holiday season, Mary and Michael wanted to create some sweet rewards where the local community could pick up fresh breads, cupcakes, a “design your own” cake, a cake decorating class, a cake for large parties, and a bread making class. For those outside of the area, they could pre-order “Christmas Morning,” which includes Michael’s Holiday Fruit Cake with candied orange peels and recipes from some of the most popular items in their bakery. Also included are a few recipes from some San Francisco notable pastry chefs like Yigit Pura, winner of “Top Chef Just Desserts.” Yigit Pura was so supportive of this Mom and Pop Bakery that he makes a cameo in their Kickstarter video. Yigit proudly carries Noe Valley Bakery breads in his Tout Sweet Store in Union Square Macy’s in downtown San Francisco. The Gassens are rewarded daily by smiles on customers’ faces which never grows old or ever gets stale. Mary still crunches the numbers and Michael is in the back of their tiny store rolling out the dough to make his signature fresh baked goods every day. They can’t wait to finish up their remodel by rallying a community supporting their all-American Bakery… where everything is made in house!